Now that the weather has become consistently nice, and what normal spring weather should be, I'm taking every advantage to get outside. 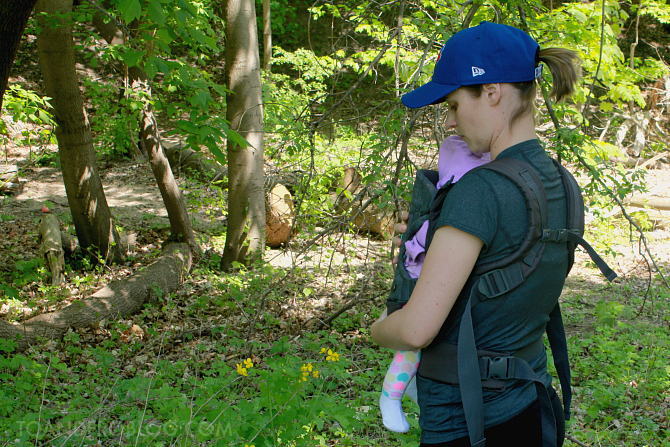 One of my new favourite things is to strap baby in the front carrier and hit the trail behind our house. As a new parent, I have had to adapt to the lack of time. No time to do the laundry, no time to do the dishes and no time to work out (and off that extra baby weight) because someone constantly needs my attention. Rather than seeing baby as an ‘obstacle’ to getting things done, why not take advantage and incorporate him or her into your routine? 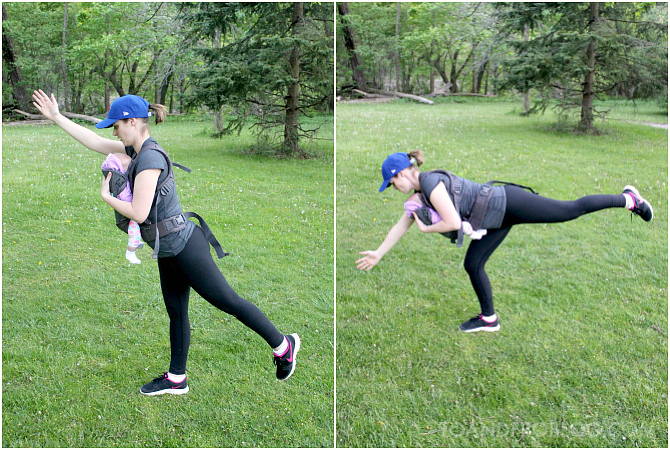 Baby-wearing is not just meant for getting from place to place or calming a fussy baby, it is also a good workout! Wearing baby while working out adds great resistance, and as your baby grows, so does the resistance. 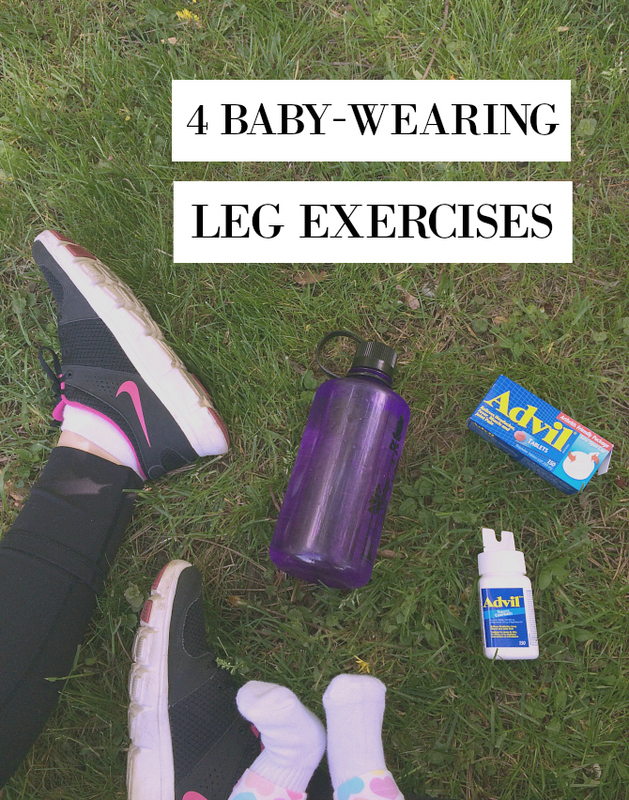 Check out these 4 baby-wearing leg exercises for the next time you hit the park with baby. Begin by standing with your feet shoulder width apart, with hands on baby's back. For balance, if needed, place one arm out in front parallel to the ground. Lower your body as far as you can by pushing your hips back and bending your knees until your thighs are parallel to the floor. Pause, and slowly stand back up, pushing your body weight into the ground through your feet. Begin by standing with your feet shoulder width apart, with hands on baby's back. Step back with one leg, flexing the knees to drop your hips. Descend until your rear knee nearly touches the ground. Instead of returning to standing, bring the rear knee forward to hip height. Return to reverse lunge stance. Begin by standing with your feet shoulder width apart, with hands on baby’s back. Step forward with one leg, flexing the knees to drop your hips. Descend until your rear knee nearly touches the ground. Your posture should remain upright, and your front knee should stay above the front foot. Instead of returning to standing position, bring rear leg through and repeat on opposite side. Begin standing with your feet shoulder width apart, with one hand on baby's back. Firmly plant one foot, with a slight bend in your knee. Extending the arm of the planted foot in front, bend at the hips and raise the opposite leg. Push the raised leg straight back, as if trying to push a wall away with the heel. When returning to standing position, slowly lower raised leg, engaging your planted leg. Don’t forget to add a warm up before working out. When wearing baby, a fast walk is safest. Focus on alternating between slow and brisk walks to get your heart rate up. After your routine is done, add in a slow walk to cool down and don’t forget to stretch. Remember safety first! Not only does your form have to be correct so you don’t injure yourself, you also want to make sure baby is safe. Be aware that if you are postpartum, your balance may not be what it used to be pre-baby. Take it easy and go at your own pace until your feel comfortable. Make sure your baby carrier is worn properly - keep baby tight and make sure their head is supported and stable and their face is always visible. When doing your exercises, find a shady spot so that baby is not exposed to the UV rays. I love to workout, but there's always one thing that seems to stop me from giving it my all. Back in 2009, I underwent surgery for a trapped nerve in my left elbow. Over 7 years later, the pain is still with me and often prevents me from doing the things that I enjoy. Today, I turn to Advil so that I can focus on saying yes and not on the things that hold me back. 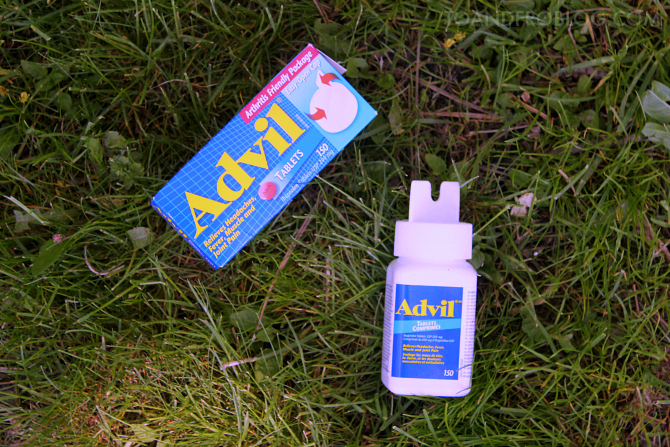 The medicine in Advil is the one doctors recommend most for joint pain, more than the medicine in Tylenol or Aleve. ** (**Based on a survey of monthly doctor recommendations.) And now, Advil comes with an EZ open cap, perfect those struggling with Arthritis or other joint pain, just like me. 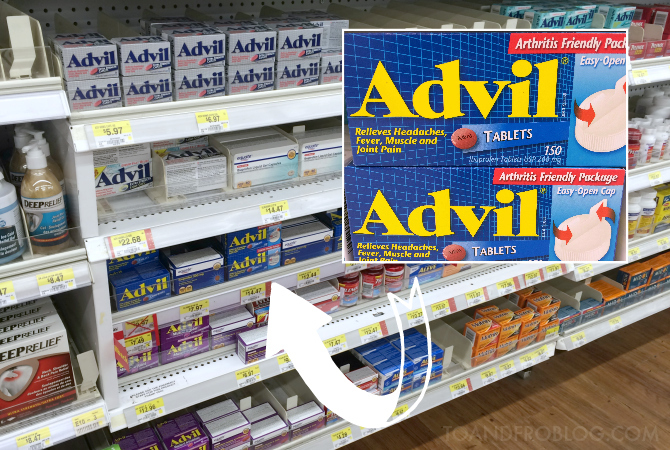 Advil EZ Open can be found in the pain reliever aisle of the Health & Wellness department at your local Walmart. Do you suffer from Arthritis? Check out this Better Living ToolKit from the Arthritis Foundation, which is packed with information and resources. How do you find time to incorporate fitness into your routine? Does Advil play a role?